Welcome to the official website for West Market Veterinary Hospital! Our Greensboro animal hospital provides a wide range of veterinary services, from routine wellness care to major pet surgery. Our ability to handle both everyday and emergency issues makes us a full-service veterinary hospital. A top-quality Greensboro animal hospital requires a top-quality Greensboro veterinarian -- and we have two of them! Dr. Elizabeth G. Murray and Dr. Ron Murray were both tending animals from a very young age, and today they continue to maintain a family farm. 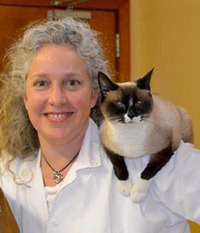 In addition to veterinary care for dogs and cats, our veterinarian Dr. Elizabeth Murray also sees pocket pets. Wellness Care - Preventative wellness care is the first step toward keeping your pet healthy for life. Our veterinarians in Greensboro can administer regular wellness exams, vaccinations, parasite prevention programs, and ongoing advice regarding diet, weight, nutrition and other home care practices. Dentistry - Your pet's teeth and mouth play a major role in determining his health and comfort. Our pet dentistry services include regular dental exams and cleanings to check for problems and reduce the risk of periodontal disease. We can also provide any necessary treatment for dental or oral problems. Health Maintenance Service - If you pet suffers from a chronic ailment or recurring health condition that requires ongoing monitoring and care, our health maintenance service fits the bill. We provide soothing, healing laser therapy to relieve aches and pains and nutraceuticals for symptom relief and overall health support. Boarding & Grooming - Veterinary boarding & grooming can keep your pet healthy, comfortable and safe. Grooming conveys important wellness benefits, while boarding ensure that your pet can receive medical care, exercise and affection. Diagnostic Services - Our sophisticated diagnostic services, including radiology and on site laboratory services, enable us to detect health problems in their early stages and make quick, accurate diagnoses in emergency situations. Our film-based radiology equipment gives us a detailed look at the structures inside your pet's body, while our on site laboratory lets us check for blood count abnormalities, internal parasites, viral and bacteria infections and signs of organ dysfunction. Greensboro Emergency Animal Hospital - We are ready to provide urgent or life-saving emergency care when your pet is in trouble. You can count on our Greensboro emergency animal hospital! Pet Surgery - We can perform a variety of surgical procedures. These may include everything from routine care (spay and neuter surgical, skin tumor removal etc.) to emergency pet surgery (foreign body removal, intenal organ surgery or fracture repair). Hospitalization - Some forms of treatment require extended stays. We're happy to provide hospitalization as needed at our full-service veterinary hospital. We can even isolate animals with infectious diseases to keep other patients safe. Need a Veterinarian in Greensboro? Contact Us Today! If you need a veterinarian in Greensboro, call (336) 292-4753 today. We're ready to help your furry family members thrive!